Toni, friend and reader from Oregon, missed receiving an email notification of the last post. The delivery system for those notifications are from “feedburner” which is owned by Google. It’s all automated so unfortunately as with all automated things we are at the mercy of the system. 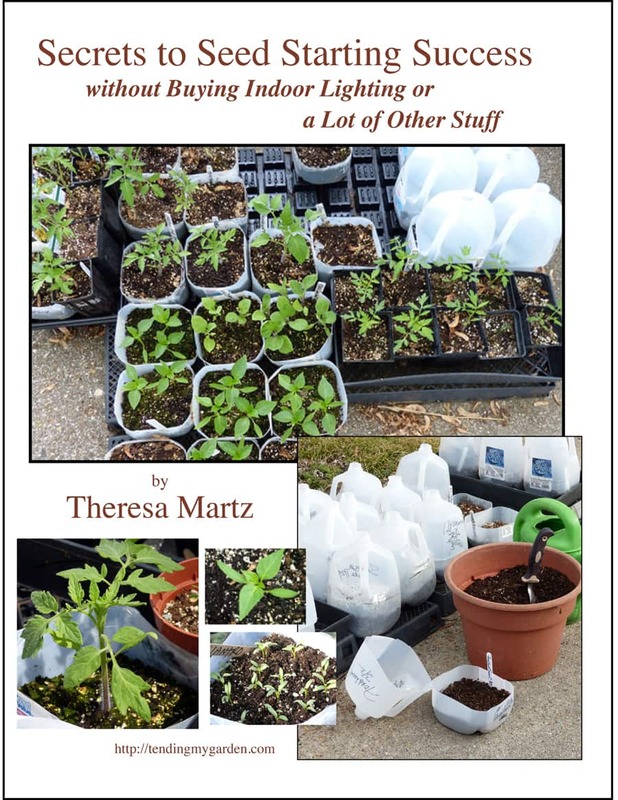 Fortunately, Toni visited TMG to look for a past post and happened to see the new post telling about and offering 25% off my brand new PDF on Secrets to Seed Starting Success. Thus, she was able to take advantage of that special offering to subscribers. I keep wondering how many other readers did not receive the post notification and therefore, they know nothing about the offer. If you’re one who did not receive any email notification I apologize. Hopefully you will receive notice of this one. Lisa (a good friend, reader, and neighbor) very kindly took the time to look over the book for me. She made a suggestion to add a point that I had not covered. In addition I had other things that I wanted to add as well. As it turned out, I added another 10 pages of content! How about Cucumbers and Squash? Do You Need to Fertilize Your Seedlings? I think beginners especially will find the two-page Quick Start Guide very helpful. You can print out those two pages as your to-do list and then refer to the manual as you need to. And of course, the pictures I’ve included will be helpful. They give a page of “instructions” at a glance. Do you think I covered the topic thoroughly enough? Do you feel it will benefit experienced seed starters as well as beginners? it meets up to that? I think I owe you $20 just for proofing it. — I think it’s very thorough and works for all levels of experience. Your years of paying attention and research, plus the photos, websites and charts make it valuable to a range of gardeners. One can just get the basics or go as deep as internet (research) will take you. I think it’s worth the price. And just so you’ll know, Lisa starts her vegetables from seed too. The pre-release special offer of $14.97 which is a $5.00 savings on the regular $19.97 price ends March 15, 2016. Also taking advantage of the pre-release special will entitle you to another bonus: the benefit of information in the form of questions (and my answers) that may come after the report is officially released. Questions are invaluable because we learn so much from them. They force us to look at things in a manner we may not have thought of. Although I’ve tried to anticipate questions, there are bound to be others that surface since there are a lot of folks out there. When and if that happens I’ll send out to you an addendum to Secrets to Seed Starting Success in PDF format. When you go through PayPal you can use either your charge card or your PayPal account if you have one. If you’d rather send a check (a few folks have done just that) email me at tmartz6@verizon.net and let me know. Take advantage of the pre-release special ($14.97) and save 25% while it’s on your mind. Soon I’ll be ready to send your course to you in PDF form. You’ll be able to read it on a PC or a Mac. And you can print it out if you’d find that helpful. When you get yours, please let me know what you think and how you like it. Your feedback helps me to help you more as we go along. In the interim, if you have any questions, just ask. Remember – March 15 is the deadline for the special offer. At midnight when the clock strikes 12 and March 16 begins, the report will be $19.97. Still a good deal, but it’s always nice to save a few dollars. Order now to get the $14.97 price. When do you think you will be emailing the book? The seed starting date is quickly aporoaching. Excited to read it! I would rather pay with a check. Does the $14.97 include postage? Please send mailing address and thanks. Lita, your report will come to you as a PDF attached to an email from me. No shipping is involved. You’ll be able to read it on a PC or a Mac. And you can print it out if you’d find that helpful. I also just sent you a personal email in reply to your question. Loretta, I’ll be able to send the PDF as early as tomorrow. Thank you both for your questions. Is it possible to get it in the printed form (paper). I don’t have a printer. I’ll send you a personal email in reply to this Lita. The “Secrets to Seed Starting Success” is wondeful. I have already learned a great deal. One that stands out is limiting the amount of individual seeds I plant in my winter sown jugs. That has helped immensely! Thank you Toni for letting me know! I read the whole PDF yesterday and am thrilled to have so much info in one place! I really appreciated learning about safer plastic jugs and how my seed starting mix and fish emulsion weren’t as organic as I want! Question: If all of the seeds (3) in a tomato jug come up, do you cull down to one or does it just vary? I’m so glad you were able to finish the PDF and that you learned a lot Julie. I tried to put a lot of information in it that I had not covered before. Regarding your question about 3 tomato seeds in a jug — yes, it does vary. If they get big enough to transplant without repotting — that’s great. If it’s going to be too long a time in the container, you might want to move each seedling to a larger pot so they’ll grow larger. As far as culling (or cutting off one or two seedlings) I wouldn’t do that unless the seedlings look puny rather than robust. Hope this answers your question. If not, feel free to ask more. I would like to send you a check. Can you email me your address?